Living out of step fits right in with Dondero's songs of tough and kindhearted outcasts, eccentrics and survivors who live out of sight, but in plain sight. Living out of step fits right in with Dondero's songs of tough and kindhearted outcasts, eccentrics and survivors who live out of sight, but in plain sight, for those who will see. The front and back cover of David Dondero’s latest, 2013 album This Guitar is a panoramic photograph he took of a mountainous landscape in western Montana. There's a gray-blue, cloudy sky. A train rolls by in the foreground. On my LP, the shadow of a vertical line seems to intersect the image on the front cover, for some reason making me wonder if it’s the reflection off a window, if he might have taken the photo from another vehicle, an automobile, or maybe even another moving train. 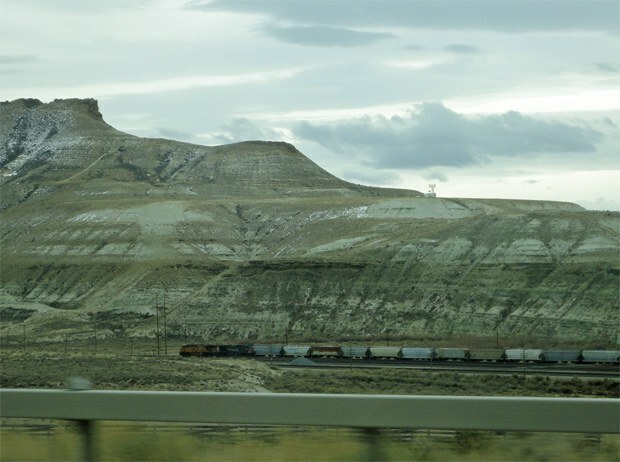 This Western landscape, and the train, evoke America. They evoke the past and present; the freedom to move on. They make us think of progress and what’s been left behind. They’re also standard country-music tropes. Even today, when the focus is on creekbeds and Caribbean vacations, trains still show up from time to time. Trains or train depots appear on nearly all of Dondero's ten studio albums. So do alcohol, heartbreak and other classic country, classic American themes. He’s not a country singer per se, though country is present in his music. His 2011, mainly-covers album, A Pre-Existing Condition includes songs originally by Jimmie Rodgers and Charley Pride, but also Bob Dylan, Neil Young, Elizabeth Cotton and Jawbreaker. Yep, there’s a punk backbone in his music, too, though he’s essentially a folk singer. He joked on one song that he plays “the skinny indie white-boy blues”, but there’s more to it than that. He more obliquely once sung of it as the “outbound sound”, a reference again to leaving but also to identifying with outcasts. The word most likely to be used to describe him is “troubadour”, though that may have as much to do with his traveling ways as with the singing part. The Transient is how one album and song title rephrased it. Indeed, to listen through Dondero’s albums is to hear all the places he’s lived and visited. It’s to take a tour of America. To go to Alaska and Florida. To visit gentrifying cities and silent wilderness. To stumble out of bars in San Francisco and eat your way through New Orleans’ po-boy restaurants. Dondero has sung about the peacefulness of Laramie, Wyoming; feeling pulled toward North Carolina; leaving behind the desolate weirdness of Alaska; hissing back at a snake in Yosemite; riding the Mississippi River where it’ll take him; seeing Kenny Rogers sing at a rodeo in Austin; and encountering something like religion in the Rothko Chapel in Houston. He’s sung, jokingly, about linguistic variation across states, in a song (“Call Me D”) where he also describes his homebase like this: “Me I’m from Carolina / just like I’m from Minnesota / Illinois New Jersey /and Georgia / now it’s Florida”. He sang that on his debut solo album The Pity Party, in 1999, at least a few states ago. Louisiana, California, Alaska, Oregon, Texas, no doubt some others. This is the ramblin’ man you hear about in so many country songs, the one who always feels compelled to move on, to see what’s around the next corner. “Should I stay or should I go”, he asked from a train depot in Clemson, South Carolina at the end of his second album, quoting the Clash. He’s sung about following songs wherever they lead him and feeling like has has to go a certain direction, usually the opposite one of where he is now. On “The Transient”, he eloquently pinned down the comfort in moving on, the certainty of uncertainty: “Let’s go down the road / ‘til we know where it goes”. But of course there’s always another road. He’s a poet of vehicles, singing about traveling by bus, boat, car, train, foot. Not airplanes, though. He’s staying close to the ground, to dirt, to people in their home environments. The promise of love and escape from heartbreak figure into this moving-around, almost always. He’s sung both about the importance of freedom in a relationship and about the strife it causes to let yourself get too free (“you shouldn’t leave a lover alone too long”). Many of his songs about moving on are also songs about who was left behind. Other times he gets more explicit about heartbreak, ripping himself open to reveal a chestful of confusion – on looking-back chronicles like “Pornographic Love Song”; poetic reveries like "The Stars Are My Chandelier"; analyses of break-ups like “When the Heart Breaks Deep”; the wistful “I’ve Seen the Love”, a truck-driver-style country song which pairs disappointment in love with disappointments in the making-music business; the defensive, self-protective “If You Break My Heart” (you’ll pay for it), and many more. Sometimes he sings the straight-up blues. Witness titles like “The Lonesomeness That Kills”. The moving and rambling in Dondero’s songs is quintessentially American, quintessentially folk and country. But while dodging permanence he also does a fair amount of dodging genres and the expectations of genre. You can hang on him various jackets – reference his acknowledged influence on Conor Oberst (Bright Eyes), his indie-punk roots, the times when he expresses the sort of outrage that would tag him as a protest singer. But each time he starts falling into what you expect, he’ll throw a foot in another direction. In albums that at first seem monolithic in style, he’ll come at listeners with a Tom Waits-ish Beat poem, with a punkier/garage-rock-ier stomp or a song that’s goofier or more sentimental than you expect. This Guitar starts off surprisingly lush with “Roses and Rain”, a quietly sung, “pretty” sad song about heartbreak on a rainy day in Portland, Oregon. The song’s gentle sheen somehow insinuates itself into the sound of the rest of the album. Dondero seems to deliberately walk against the grain of the prevailing culture. Songs you might consider “political” (protest songs) invariably revolve around a deep gut reaction against gun culture, which runs closely along in Dondero’s world with a culture of stubborn narcissism and selfishness, a turning against values of community and the collective good. In a press release about This Guitar he admits that the song “Boxer’s Fracture” stemmed from a real-life incident where he got a so-called boxer’s fracture in his hand, not from boxing but by punching a bar, in anger at hearing the news of the movie-theatre shootings in Colorado. Within Dondero’s personality, on record, is a built-in melancholy about what we’ve together lost as the years go by; what we sacrifice in the name of progress. This sometimes is expressed through a fixation on particular objects of the past: a 1973 Chevy, a found wedding band, a cane made from a rubber tree. Other times it’s through a general disgust at the life people around him live: The attention they give to their lawns and their cell phones; how they vote, how they spend their money, what they value. This opposition to current trends may not be unrelated to the way he sometimes seems to deliberately move away from advancing a “career” in music, even as traveling around making music is his life and livelihood. The title track to This Guitar -- played, almost perversely, not on a guitar but a piano – chronicles what music has given him and how it’s ruined his life. His guitar sweet-talks him, haunts him and brutalizes him. In songs like that he puts himself on an even level with the people he sings about in his overall body of work. If it’s easy to list the many places he’s sung about living in or traveling to, it’s just as easy to transcribe a litany of the people in his songs. And they’re all eccentric, down-on-their-luck figures following their own path, to sometimes tragic ends. There’s Alex, in the halfway house at age 45; Michael Raines, who finds himself in jail for cocaine distribution; the colorful, tender-hearted Lone Rose, who overdoses; “The Waiter” who gets involved in a murder by corkscrew ; a man getting out of jail after “Twenty Years”; a bush pilot in Denali National Park who dies in a plane crash; Samantha, a Santa Claus-attired transgender rebel/activist who nearly dies from a hate-crime attack, then kills herself in the wake of it; and many more. Death befalls many of his characters, be it in songs meant as elegies or songs played slightly for laughs, or more precisely storytelling power. Those that are alive are struggling. But just about always they’re people with good intentions and tender hearts who have fallen out of step with society for one reason or another. By telling these stories – stories, one gathers, he’s picked up by encountering such people – he’s keeping alive a particular story of America that runs in a different direction, not just from the current mainstream-country portrait of America, but also our overall American culture’s trends and stories. These are people living out of sight, but in plain sight. That’s a point Dondero continually makes while telling their stories. And he puts himself in their place too, both in terms of his music career and in the way his songs resemble autobiography, albeit working within an American mythology at the same time.